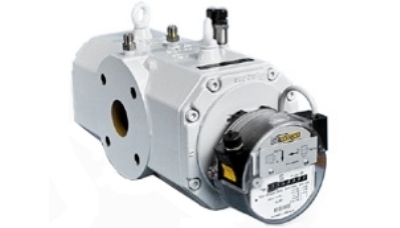 Diaphragm or Bellows meters are the most common type of gas meter. They are used in almost all residential and small commercial installations. The meter contains two bellows assemblies which alternately fill and expel gas, producing nearly continuous flow through the meter. The adjacent animations show how the bellows meter operates. A small portion of the working pressure of the gas is used to operate the instrument. At first bellows 2 is filling which simultaneously expels gas out of chamber 1. When bellows 2 is full, a mechanical linkage slides the valving system to a new position. This allows bellows 3 to start filling which simultaneously expels gas from chamber 4. When bellows 3 is full, a mechanical linkage slides the valving system to another new position. This allows chamber 1 to start filling which simultaneously expels gas from bellows 2. When bellows 2 is empty, a mechanical linkage slides the valving system to a new position. This allows chamber 4 to start filling which simultaneously expels gas from bellows 3. When chamber 4 is empty, a mechanical linkage slides the valving system to a new position completing the cycle. This cycle continues so long as gas is being consumed by an appliance. Diaphragm gas meters are positive displacement meters. 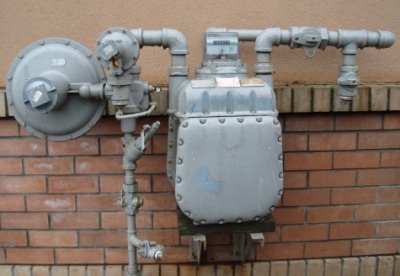 A known quantity of gas is measured as the meter aspirates. As the diaphragms expand and contract, levers connected to cranks convert the linear motion of the bellows into the rotary motion of a crank shaft. This shaft can drive an odometer-like counter mechanism, a set of dials or it can produce electrical pulses for a flow computer. Rotary meters are highly machined precision instruments capable of handling higher volumes and pressures than bellows or diaphragm meters. Their design is based on the 1846 lobed impeller water pump design of the Roots brothers. Rotary meters have evolved and improved through more precise manufacturing processes, use of modular designs, better materials, and electronics. They have a proven record of consistent accurate performance. Within the meter, two figure "8" shaped lobes, the rotors (also known as impellers or pistons), spin in precise alignment. With each turn a specific quantity of gas is metered. The rotational movement of the crank drives an odometer-like counter or it can produce electrical pulses for a flow computer.